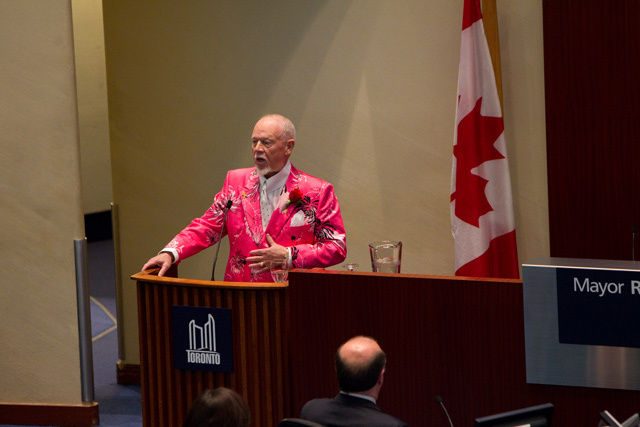 This afternoon, at Rob Ford’s investiture, and wearing a bright pink suit for the occasion, special guest Don Cherry hung the chain of office around Ford’s neck. He then delivered a brief speech before city council, family and friends of city council members, and the media. This is that speech. Actually I’m wearing pink for all the pinkos out there that ride bicycles and everything. I thought I’d get it in. What’d ya expect, Ron MacLean, here? To come here? You know, I am befuddled, because I thought I was just doing a good thing, coming down with Ron—Rob—and I was gonna do this here, and it was gonna be nice and the whole deal. I’ve been bein’ ripped to shreds by the left-wing pinko newspapers out there. It’s unbelievable. One guy called me a pink…a jerk in a pink suit, so I thought I’d wear that for him too, today. You know, it’s funny. In those articles I was made fun of ’cause I go to church. I’m easy to do it that way. And I was called maudlin for the troops, because I honor the troops. This is the kinda, uh… You’re gonna be facin’, Rob, with these left-wing pinkos. They scrape the bottom of the barrel, but AGAIN, I was asked, why I was asked, and I asked Doug, “why?” And he said: “We need a famous, good-looking guy.” And I said, I’m your man, right? Right off the bat. “No! It’s down. Cut it down.” And then they give her, send her a bill for five-thousand dollars, for cutting it down. And for eighteen months her son and Fiona were: “City Hall. City Hall. Please help us.” Thirty, forty calls. Unbelievable. Nothing. Laughed at. Rob’s the mayor one day, apology comes, and a five-thousand-dollar cheque. And that’s why I say he’s gonna be the greatest mayor this city has ever, ever seen, as far as I’m concerned! And put that in your pipe, you left-wing kooks.